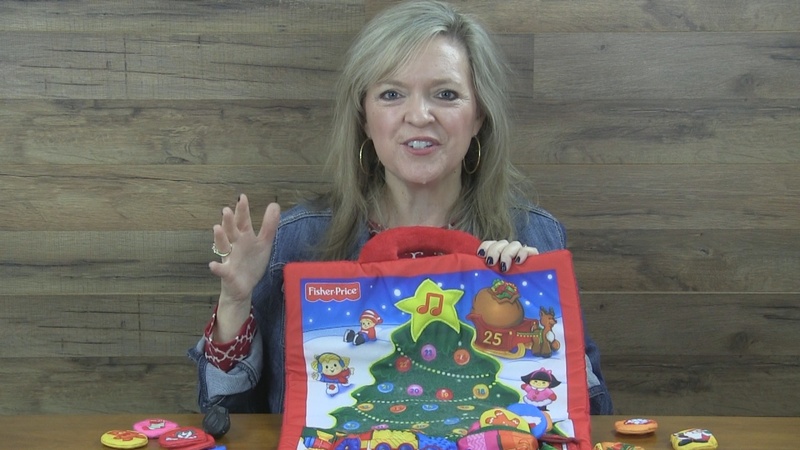 Pediatric speech-language pathologist Laura Mize, M.S., CCC-SLP from teachmetotalk.com shares ideas for modifying a classic Christmas tradition, an Advent Calendar, for late talking toddlers and young preschoolers who love numbers. Don’t think that it’s too late this season to begin this activity! You won’t be using the calendar in the traditional sense of “counting down to Christmas,” so it’s okay to use this activity ANY DAY in December, or frankly, any other day of the year too with a child whose well-established interest is recognizing numbers. Traditionally, an Advent Calendar is a tool to help count-down the days and weeks until Christmas day. Of course, toddlers aren’t yet developmentally ready to comprehend concepts like time – especially days and weeks. Kids won’t understand those kinds of things until they are around kindergarten-age, so don’t worry about trying to teach those kinds of things to a late talking 1, 2 or 3 year-old! We have more important priorities! However, some young children, particularly those with autism, can become obsessed with numbers, even when they’re saying few other words. When a child is demonstrating this kind of clear interest and activity preference, we can use that to help them learn other things that aren’t coming so easily for them, such as understanding and saying new words. Watch the video for 3 different Advent Calendars and several ideas for therapy activities. For new vocabulary, you’ll focus on teaching what the new words mean. Late talkers need to hear a new word over and over before we can expect them to remember it, understand what the word means, and eventually learn to say the word. You can also use this kind of toy for helping a child learn to follow simple commands or select the correct ornament when you say things like, “Where’s the snowman?” or “Find the puppy.” Or set out several choices and ask a child “Get the _____.” When he finds the correct choice, he can put it on the tree. When a child makes a mistake, don’t emphasize it. Watch the video for how to redirect a child’s wrong responses. I purchased this toy from fisher-price.mattel.com a year or two ago. Even if you can’t find this version of an Advent Calendar, you can use the ideas with ANY toy with several “parts.” Target a child’s receptive goals of following directions or identifying objects or her expressive goals by requesting the next piece before she performs the next action during play. This calendar is fabulous for using with young children because of the pockets! Fill the pockets with small toys. Some SLPs may like to use picture cards or flashcards for this kind of activity, but I prefer real life objects – especially for young children. For kids who love numbers, you’ll make a big deal about asking, “Where’s number 5? Let’s see what’s in 5?” You’ll let them find the correct pocket and then pull out the item. For children who aren’t talking yet, name the object in a super fun way using your voice and your facial expressions. Some adults resist changing the way they talk to young children, but this is especially important for toddlers with language delays. They need a reason to look at you, pay attention, and learn to listen to what you say so that they can begin to understand what words mean and certainly begin to imitate what you say. A child is much more likely to attend to a grown-up who looks and sounds fun! Many times that’s the one change I encourage parents to make during our very first visit together. Remember that you can use the ideas in this video with ANY toy with pockets! Previously, I mentioned that I made a version of this calendar several years ago. It’s easy! Cut out a tree using green poster paper and add pockets using extra poster paper or even envelopes. For kids who love numbers, write numbers on the pockets to increase interest. If you’re super crafty, you could also make an Advent calendar from felt and then use it year after year. I love this book! It’s gorgeous, but fragile, which means that you won’t be able to use it with all toddlers and preschoolers. However, for kids who love numbers, it will be mesmerizing! There are numbered flaps and puzzle-like pictures which attach to the beautiful, pop up tree. To use this book in therapy, ask a child who already knows numbers something like, “What’s in number 3?” Implement the same kinds of strategies we’ve already discussed to target receptive and expressive language. I found this calendar after I shot this video and I adore it! Magnets… how fun!! My plan for this toy is to combine a few of the magnetic ornaments that come with the calendar along with my other magnet sets. I may even throw in a few magnetic letters if that’s what a kid really loves. I’m including a link for my favorite magnet sets below if you don’t have any of those. I’ve used these magnet setes everywhere – from in my office on a cool magnet wall I made from oil drip trays (thanks for the idea Pinterest!) to taking them for visits in children’s homes on their own refrigerators!